A staple in every toolbox, the hammer has retained the same basic head-and-handle design for hundreds of years. For craftspeople such as carpenters or roofers, years of hammering can take their toll, resulting in the painful injury known as tennis elbow. It’s a condition Fiskars, most well-known for its orange-handled scissors, hopes to alleviate in its customers. And University of Wisconsin–Madison industrial engineers recently helped the company test how effective its new shock-absorbing hammer is at helping users avoid overuse injuries. “We provided physiological evidence that there is a benefit to using the shock-absorbing hammer and we’ve also looked into some of the mechanisms that cause overuse injuries, which could help us prevent people from getting hurt,” says Rob Radwin, a UW–Madison professor of industrial and systems engineering. Radwin’s research, published in the journal “Clinical Biomechanics,” demonstrated that Fiskars’ new hammers deliver more energy with every swing and cause people less muscle strain. The results helped Fiskars decide whether to take its new product to market. Fiskars’ IsoCore tools — which include hammers, sledgehammers, a maul and a pick — contain a special sheath of vibration-dampening material in their shafts, an addition designed to reduce the preponderance of injuries such as tennis elbow among people who hammer heavily. Tennis elbow may sound tame, but the painful muscle strain in the upper forearm often requires time off to rest, see a doctor, undergo physical therapy, get injections or even have surgery to rehabilitate. Long, involved recuperation and treatment often isn’t an option for carpenters or roofers whose livelihoods depend on their ability to pound nails. The reasons such workers end up with musculoskeletal injuries remain poorly understood. Researchers long speculated that holding onto shaking objects like hammers and tennis rackets activates an involuntary reflex that makes people grip more tightly, and that this clenching strains muscles in the forearm. But when product developers at Fiskars measured vibration in different kinds of hammers, they found relatively low amounts of shaking in the handles that have been shown to affect grip and result in musculoskeletal disorders. 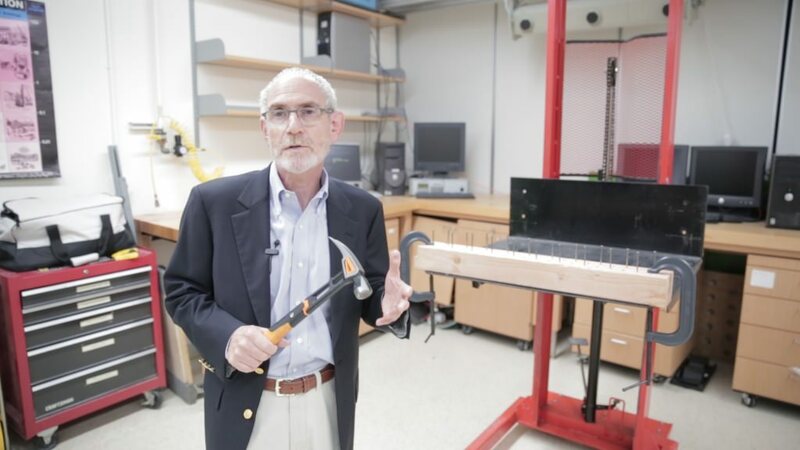 Fiskars engineers called on ergonomics expert Radwin, who used his own unique suite of research tools to determine whether the new hammer caused less strain to users than the other implements on the market. Radwin reasoned that vibrations in the handle might not be the culprit. Instead, behind hammer-induced tennis elbow may happen because every time a hammer-head strikes a nail, the sudden stop causes a mechanical shock that pulls on the forearm muscles. Overstretching those muscles could cause strain in the tendons in the forearm by tugging on muscles in the forearm, eventually causing tears in the tissues. Radwin’s lab recruited a group of volunteers to perform an exhausting bout of hammering: 20 nails in quick succession. The researchers monitored the motion of the hammer with ultra-high speed video, measured the participant’s muscle responses during the trial by recording electrical activity in the arm, and — most importantly — scanned volunteers before and after the task with the MRI machine. “It was a lot. We had people do a very strenuous task. They were very fatigued at the end,” says Radwin. The high-speed video showed that the shock-absorbing hammer delivered the most kinetic energy to the nails on each swing. Most importantly, however, images from the MRI revealed that people who used the shock-absorbing hammer displayed less evidence of muscle strain in their forearms. Additionally, the data didn’t reveal any differences between how tightly people gripped the new product versus how tightly they gripped conventional hammers. These results definitively nailed down the benefits of the shock-absorbing hammer, providing further justification for Fiskars to move forward with their product and opening the door to future collaborations with UW–Madison. Other authors on the study include Kimberly A. Buchanan, Maria Maza, Carlos E. Pérez-Vázquez, Thomas Y. Yen, Richard Kijowski and Fang Liu. Fiskars Brands, Inc. and the UW–Madison Tool Ergonomics Research Consortium supported the research.